Skyscript.co.uk :: View topic - 3D Houses: The most accurate method of house placement? Mark's point about the 'collapse' of Campanus houses at even quite modest latitudes is also a concern for me. However, the following data shows that the difficulties might not quite be quite as challenging as they first seem. Statistically, Porpyry and Campanus offer the same degree of significance (or greater) than Placidus/Gauquelin divisions of the sphere. This is interesting research data! 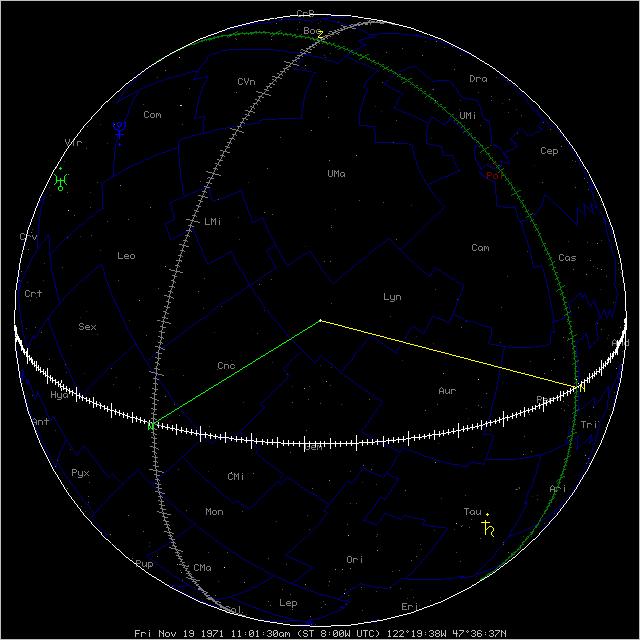 I know that Gauquelin Sectors are computed using a technique similar to Placidus cusps, and in fact can be approximated with them (see Astrolog's "-l0" command switch). It looks like similar techniques can be done with other house systems too. As an aside, I consider these representations as "2D" - two astronomical coordinates are represented. Conventional charts are 1D - only the "longitudinal" coordinate is represented. You're right, at least when considering a single planet. However, I use the name "3D houses" because it's considering the set of planets in a chart as a whole. A standard chart has all planets placed on the 2D plane of the ecliptic, and ignores their 3D latitudes rising up out of that plane. A 3D chart sphere works with the full 3D model of the planets in space with their different latitudes. As a followup to the above, 3D houses are actually similar to Gauquelin sectors in several respects. Gauquelin sectors are computed based on the rising and setting times of planets, which is similar to 3D houses which are also based on the local horizon. When a planet is above the horizon, it's in Gauquelin sectors 1-18, and when a planet is below the horizon it's in sectors 19-36. That's similar to how when a planet is above the horizon, it's always in the 7th through 12th 3D houses, and when a planet is below the horizon it's always in the 1st through 6th 3D houses. Also, when a planet rises, it moves from Gauquelin sector 36 to sector 1, which is similar to how a planet rising moves from the 1st 3D house to the 12th 3D house. When a planet sets, it moves from Gauquelin sector 18 to sector 19, which is similar to how a planet setting moves from the 7th 3D house to the 6th 3D house. A new version of Astrolog has been released, and the new version 6.40 updates "3D houses" and "chart spheres" in several ways. Transit searches now support 3D houses, and will display when planets ingress into different 3D houses (and due to the 3D geometry, these ingress date/times will differ from all ordinary 2D house systems). Chart spheres are a good way to visualize 3D houses, however they now have the option to show 2D houses. Therefore they're also a good way to visualize the difference between 2D and 3D houses. Below are two chart spheres side by side, which are identical except the left sphere is using 2D houses, and the right 3D houses. In the left sphere with 2D houses, planetary latitude is ignored when determining house position, which means the 12 house "orange wedges" share the same poles as the 12 sign "orange wedges". Notice how all 12 houses have areas which are above and below the horizon, which is counterintuitive. In the right sphere with 3D houses, the 12 house "orange wedges" are aligned with the local horizon, and always have their poles at the north and south points on the horizon. In this model, all of houses 1-6 are always below the horizon, and all of houses 7-12 are above the horizon. Because the poles are different, planetary latitude needs to be taken into account to correctly determine house position. For a comparison not involving chart spheres, below is Astrolog's local horizon display (which is basically a chart sphere so unrolled so it's flat). There are two charts side by side, which are again identical except the left is using 2D houses, and the right 3D houses. In both of these charts, the middle horizontal line is the horizon, the middle vertical line is the south meridian, the vertical lines on either side of it are the prime vertical passing through the east and west points, and the far edges are the north meridian. The 12 houses are marked by the green dotted lines (and labeled with green numbers), while the ecliptic and the signs of the zodiac are marked by purple dotted lines (and labeled with purple glyphs). Planets are plotted near the ecliptic, and the Ascendant, MC, and house cusps are plotted where they intersect the ecliptic. Notice how the star Sirius (labeled "Sir") is clearly in the 5th house below the horizon, however with a zodiac position slightly later than the Descendant, all ordinary 2D house systems will place it in the 7th house, making one think it's above the horizon! Similarly, the star Polaris (labeled "Pol") is high in the sky on the meridian and therefore correctly on the 10th cusp, however 2D house systems will place it way down in the 6th house. Also, chart spheres can now display the astronomical constellations on the surface of the sphere. It can display over 1000 fixed stars at once, and stars are displayed according to their brightness. Star configurations are in expected places: For example, below you can see the Big Dipper at the top of Ursa Major (UMa), with its two forward stars forming a line pointing to Polaris the North Star on the meridian. In Orion you can see Orion's Belt of three stars, and in the upper right of Taurus the tight cluster of stars is the Pleiades. The very bright star in Canis Major (CMa) is Sirius, the brightest star in the sky.